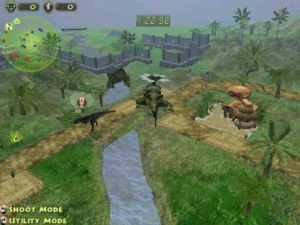 Jurassic Park: Operation Genesis is a theme park building and management sim that lets you create your own version of the most famous dinosaur park that never existed. The game is John Hammond's vision of reality in that it is possible to engineer dinosaurs and expect them to act as reasonably behaved tourist attractions. The issues and concerns raised by the book and movie are a non-factor here and in fact Dr. Alan Grant is a regular park employee in the game. Working these themes into the game would have made for some interesting play, but instead the developers decided to go the safe route and as a result the game is nothing more than an average theme park sim. Park rangers use helicopters to manage the dinosaurs. Like most theme park sims, Jurassic Park requires you to perform research in order to make new structures and attractions available for use in your park. In addition to this Jurassic Park has another research-like component in that you need to build the DNA structure for each dinosaur appearing in your park. To do so you must first obtain dinosaur fossils or samples of amber. These can be found by assigning teams of paleontologists to dig sites or by visiting the fossil market. You can get the exact fossil you're looking for from the market, but good specimens are pretty expensive so you'll have to primarily rely on the random fossils found by your teams in the field. Once you have a fossil you can send it to your DNA lab for extraction. Each fossil will yield a portion of a particular dinosaur species' DNA, and once you've extracted 50% of the total DNA code you can start creating that type of dinosaur in your park. You'll need to keep working until you get 100% of a species' DNA, though, as dinosaurs created from incomplete DNA have very short life spans. Unfortunately this is not a very interactive process and it can take some time to find new fossils. This leads to a lot of waiting when you are trying to add a particular species to your park as there isn't any way to speed the game's clock. This is an even bigger issue when playing one of the game's missions as the victory conditions will often require you to add certain dinosaurs to your park. You can spend quite a bit of time waiting to find the right fossil or hoping that it will eventually show up on the fossil market. Once you've got enough DNA to start making dinosaurs you're ready to open your park. There are two aspects to park management as you'll have to provide for both your dinosaurs and park visitors. Dinosaurs have basic needs for food and water which they can get for themselves from the environment. You can also build feeders to ensure that they have enough to eat, as they sometimes have a tendency to let themselves starve. Dinosaurs can also pick up a variety of fatal diseases that you'll need to research cures for. Should they fall ill you'll need to send your rangers in to vaccinate them or else the disease will spread and you will end up with a lot of dead dinosaurs. The other aspect of dinosaur management is security. With herbivores a little fencing is all that is needed to keep them in check. If you add carnivores to your park (visitors love to see carnivores), then security becomes a bigger concern. You'll not only need stronger fences, but also automated gun turrets, security cameras, and safety bunkers for your visitors. Carnivores also have a tendency to rampage and you may be faced with carnivores on the loose. To take care of them you can take control of your ranger chopper and use a sniper rifle to pick them off from the air. It sounds more fun than it actually is, though, and after you've done it once you won't really be too anxious to do it again. The helicopter is flown in third person mode and is confined to a single elevation, and it feels like you're driving an inertia-free car. You can switch to a first-person shooting mode in which the only real challenge is steadying the gun due to the bob of the helicopter.